Electronic Arts' Battlefield 4 has been out for some time now, but now it seems China's got a problem with its portrayal in the game. An opinion piece in China's patriotic military newspaper, Zhongguo Guofangbao, says that games such as BF4 portray China in a bad light and purposely mislead Chinese youth. Now, here at Kotaku, we like China. We want the best for China, but sometimes China sets itself up for hilarity and it can't be helped that we end up making fun of the country. We wish that would change! Previously, China's military news outlets have put out articles about the United States creating Spartan armour from Halo, used a deviantArt post as an example of Japanese military expansion, and called Guillermo Del Toro's love letter to giant robots and Kaiju a piece of US propaganda. The latter statement is kind of funny since the game hasn't exactly been released in China and it doesn't seem like it will be any time soon; especially since China has a penchant for banning media that shows the country in a bad light. Below are a few translated excerpts of the original article. American soldiers attack Shanghai, exchanging fire with the People's Liberation Army? ! 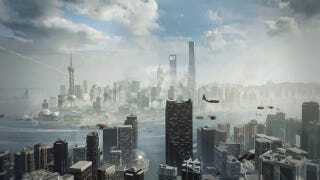 This isn't real, but it's a game BF4. This first person shooter is set in the year 2020 where China's domestic unrest in China is used as the scenario, US soldiers use the values of "fighting for peace and thwarting conspiracies" to cause problems in China and to battle against the PLA. Well of course it's not real... it's a video game. BF4 uses the political turmoil caused by a Chinese General as the main villain, and not only does the game have loads of uncivilised words and Chinese that makes zero sense, the game itself doesn't make sense. Dauid (David? ), a US gamer who has lived in China for three years, says: "This game makes me feel that the makers still look at China with their old preconceptions, the game is very unrealistic." I'm not sure if this Dauid person is real or not, but once again, it's a video game. China Public Diplomacy Association vice director Ma Zhengang suggests that to deal with western preconceptions of China, China should just continue minding China's own business and not cause trouble for the world. However, just minding our own business isn't enough. We need to rise up and share our China's voice; only we have the right and power to show the world a real China. Only we can dispel the world's misconceptions of China. Not long ago, a talk show said ,"Kill all Chinese People." This caused Chinese in 27 US cities to protest and the host had to apologise. We should also continue to resist video game media that puts China in a bad light like EA's 2003 game, Command & Conquer: Generals. That game was banned in China. Wait... Command & Conquer: Generals? The basic premise of the article was to stress the point that video games, while not real, portray China in a terrible light to foreigners and give Chinese youth an unrealistic impression of China. Which is kind of funny, since Chinese youth live in China. The article also goes back to the mainstay that Western media such as video games are tools of propaganda used to influence Chinese youth and give them Western values. With all this talk hard talk about western propaganda and how Western games are detrimental to China, the most interesting thing seems to be the fact that the military paper is looking to express China's voice and "clear" China's image internationally. However, instead of following the sound advice of a public diplomacy expert to just be good and mind China's own business, the military paper supports the idea of banning content and creating new pro-China-centric games. New China-centric games might be a good start, but all this jingoistic talk about how games make China look bad, and banning content might not be the best for China as a whole. Banning games creates a lack of competition from grade-A international development companies, which means Chinese game makers are pretty much just making games amongst themselves, which kind of lowers the bar for what passes as a grade-A game. Making content that portrays China in a good light is positive, I'm all for it, but at the same time all of this rhetoric just makes me believe that the Chinese establishment isn't mature enough to take themselves a little less seriously. This sets up a double standard and a practice of hindering domestic creativity. Of course, at the time of writing, Battlefield 4 is already available in China via the gray market, and hacked versions of the game are also available in Chinese internet cafes. The purpose of the Zhongguo Guofangbao article is kind of lost since Chinese are already playing the game—the real game at that!